In the unlikely event you have not heard, a whopping EF5 tornado ripped through the heart of the town of 50,000. 2,500 businesses were leveled and homes were completely destroyed. The death toll sits at 120, but that number is expected to rise sharply as more than 1,500 people are unaccounted for. With estimates of damage estimated to exceed $3 billion – the city of Joplin is going to need our help for a very long time. 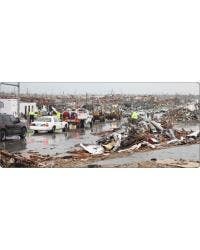 Most of us have seen the images or watched the videos of the damage in Joplin, Missouri. If you are like me you are wondering just how you can help. Convoy of Hope, whose headquarters are less than 90 miles away, has been on the scene since day 1. They have been preparing meals and passing out water to victims and volunteers. Below is a link to their site with the details on how to donate or even volunteer.